In New England, we have had a heavy dose of Fall weather in the last two weeks - crisp 62 degree days, 45 degree nights. It has inspired me to do some (as Katie would say...) "Fallizing." Here are a couple of snapshots of things I have done to "warm up" our home for the upcoming cool months. 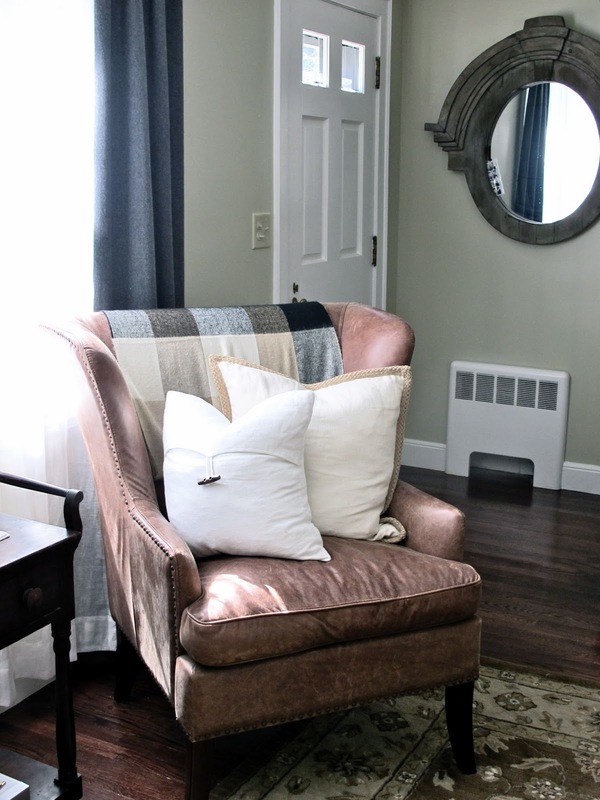 By the way, looking at these photos I am now hating the 'slate' colored coffee table that I was debating about in the spring... it looks so blue with all of the fall accents. Looks like the paint brush might be coming out - maybe a warmer grey? Or how about an upholstered ottoman? And yes, I see that I left the tv on in the background - whoops. Here is a post of the 'before' photos from when we moved in in the spring. 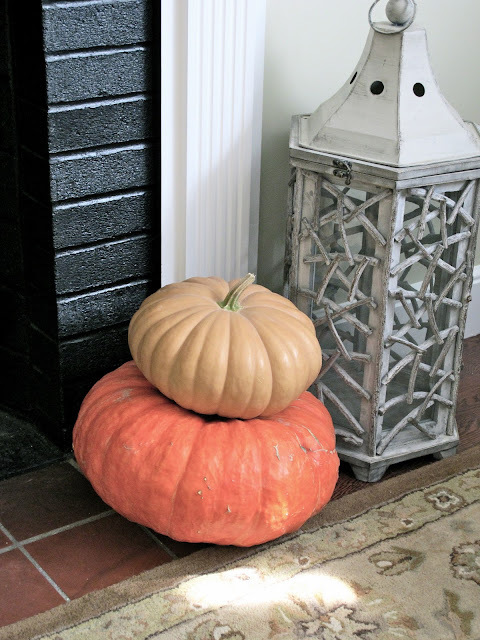 Heirloom pumpkins by the fireplace. 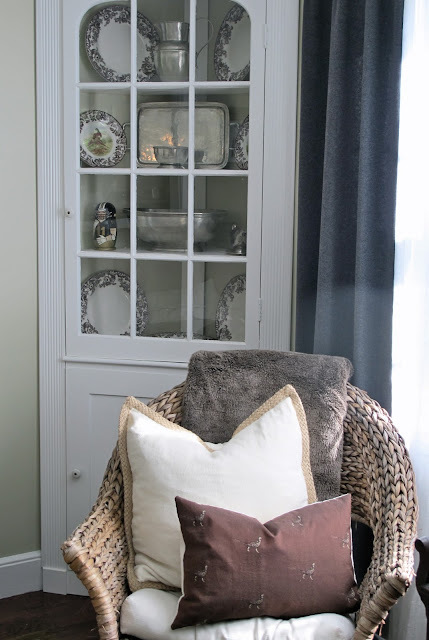 Brown fur, velvet and embroidered pheasant pillows are added to what was all white linen before. Tiger stripe (go Tigers!) vintage book, matching gourds and a black labeled candle on the coffee table. The light blue plates were replaced with my Woodland collection that goes along with my pewter. 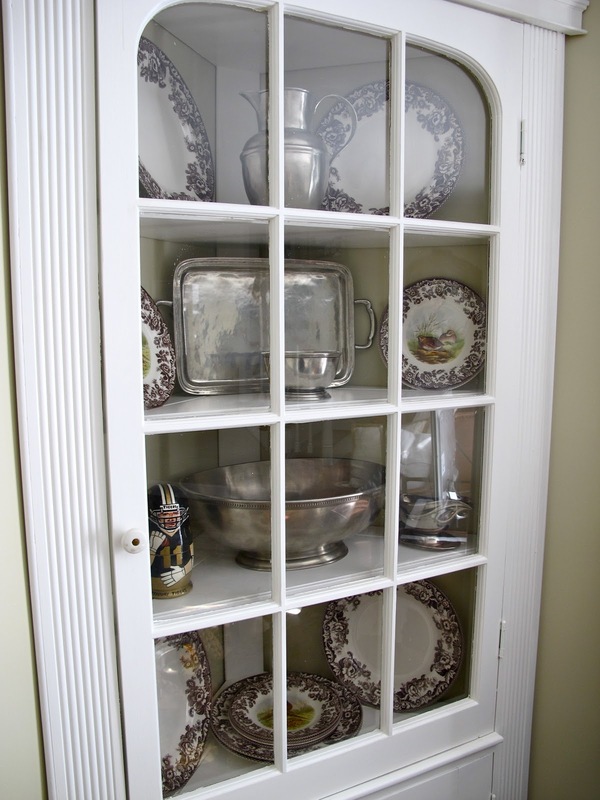 The kitchen hutch is outfitted with a couple of select Fall elements. A lot of my Everyday Essentials are featured on this hutch - click here to see the buying guide! Tiger stripe plates... again, for Mizzou watching! Leaf mini plates and a plaid dish towel. What are you doing to Fallize your home? Photos of exterior Fallizing to come... waiting for those darn leaves to turn! love the tiger touches, jenny! i vote for an upholstered ottoman. it seems far away now, but you'll want the soft surfaces once your baby girl is on the move. congratulations! I love your house. Everything is so well co-ordinated. It looks like it stepped off the pages of a magazine! 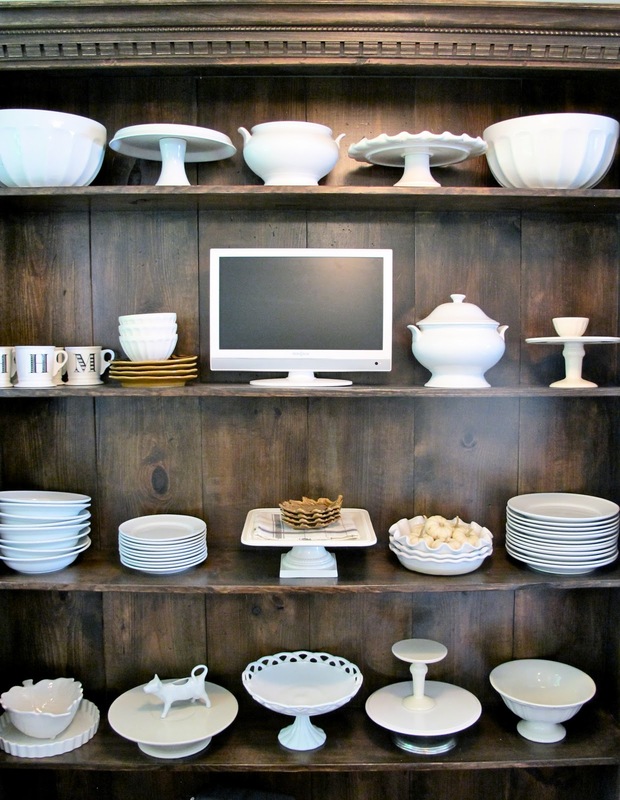 I love the white crockery in your kitchen hutch. 1. jealous of your cool weather ...we are still running the AC and close to 90 degrees in temp here in the south. 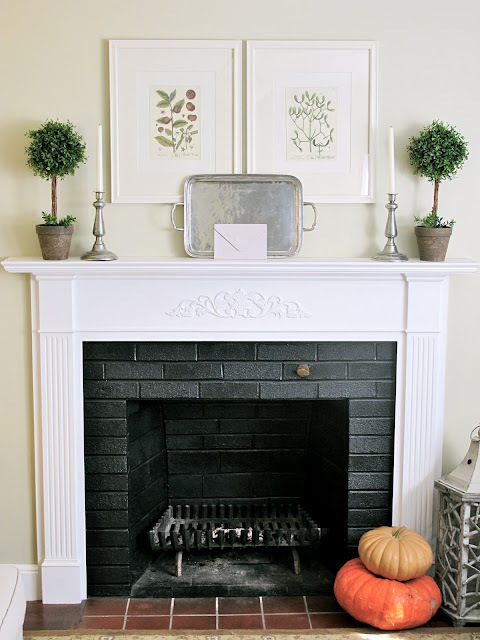 2. love all your fall touches - especially your spode with your pewter! 3. have you thought of using some shade of yellow for your coffee table? The pumpkins on the 'hearth' or at the fireplace are a really nice touch. I now wonder why I never put pumpkins by our fireplace but I will this year. We go to a very rural farmer that has discovered the marketing ploy of "heirloom" over the years - the assortment of pumpkins is just amazing! Your hutch has paused me to consider open shelving in our new kitchen. I have really nice display pieces that I would love to see on a daily basis - I just hope I can keep the display as tidy as yours. And finally, one last question. We have tall wooden stools and I would like to repaint them. Would you paint them the same colour as the walls or the same colour as the floors? They will be used at the kitchen pass through to create a breakfast area. Jessica - What color are your kitchen walls? I think you could do either... but I would paint them the same color of the walls, I think. Good luck - send pics! Thanks for your quick reply:) The walls are going to be glossy white and the floors are a dark parquet wood. Love your home! It looks very cozy! Love this! Such a cute home you have. Your home is a magazine! Love your rug! Where is it from? Really It is great article about Home Decorations. I like this blog very much. Really it is very informative to decor homes.Great job please keep it up.